Rondo D Major KV485 for solo piano (Revised Edition) (Revised Edition Piano Solo). Composed by Wolfgang Amadeus Mozart (1756-1791). Edited by Ullrich Scheideler. For Piano (piano solo). Henle Music Folios. Softcover. 17 pages. G. Henle #HN895. Published by G. Henle (HL.51480895).This Rondo was written around the same time as the Piano Concertos in A major (KV 488) and c minor (KV 491). In the course of the work, a theme from the third movement of the Piano Quartet in g minor (KV 478) is taken up and further developed. In spite of its considerable length and its musical depth the work was apparently not published during the composerÕs lifetime. The dedication, "Pour Mad:selle Charlotte de WÉ" (the rest is indecipherable) is an enigma. No matter which lady Mozart had in mind, this rondo is today one of his best loved and most played piano works. 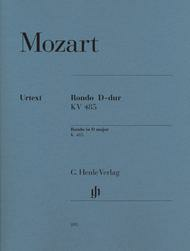 Our single edition follows the musical text in the revised volume of his piano works (HN 22), published in Mozart Year 2006.